The Wall Street Journal recently reported that many large U.S. corporations are hiring, but hiring more people in other countries than they are here at home. Eager to highlight the evils of multinational corporations, Think Progress reported on the report, noting that some companies had even cut jobs in the U.S. while hiring abroad. References to the problem of outsourcing and a look at the article’s comments section make clear how Think Progress and the left see this issue, and that this sort of information is their evidence. Here’s what they overlook. Think Progress calls out Wal-Mart specifically (because who doesn’t love to hate Wal-Mart), and then posts the chart at right. 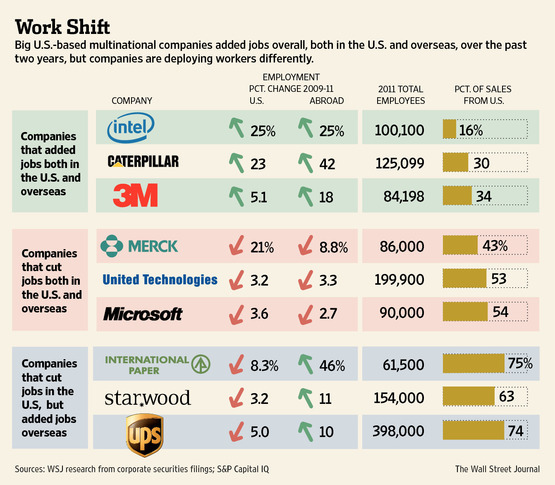 The bottom section is the group guilty of layoffs in America while hiring overseas. But these aren’t outsourced call centers and sweatshops. UPS, Starwood Hotels, International Paper. Think about what these companies do. UPS employees get in trucks and drive packages around their city, or work in warehouses necessary in every city they deliver to. UPS isn’t going to hire a driver in Detroit to deliver packages in Peru. Attacking UPS won’t save any jobs, it will just make it more expensive to order products online. In the same way, it makes no sense to blast Starwood Hotels for hiring people in Brazil to staff their hotel in Brazil. It’s not like hotel chains run sweatshops in China. They open hotels all over the world, and staff them locally. As it turns out, manufacturing in America is still strong. We’re still, by far, the most productive country in the world, and manufacturing salaries continue to rise (currently averaging around $50,000). International Paper, also on this list of offenders, is a good illustration of manufacturing in the modern world economy. International Paper runs paper mills and distribution centers in America to sell to America. They also have dozens of mills, offices, and centers in other countries. To do business in those countries. Just like Toyota and Honda have factories in Indiana and Ohio to make cars to sell in America. Just like American auto makers have opened factories in China–gasp!–to sell their cars in China. Doing otherwise would be inefficient and make their product more expensive. Attempts to impede companies’ ability to operate where it makes sense to operate will not save any jobs–it will only drive up the cost of products and services. It will make all stuff more expensive. Helping the poor, that ain’t. I know there are companies that make use of cheap overseas labor. Yes, Apple has a lot of components put together in China. But they also employ 47,000 people here at home, more than twice as many people employed abroad. And that’s only direct Apple employees–that business supports literally hundreds of thousands of other US jobs in affected industries providing raw and technical materials, services, transportation, health care. If you forced the 23,000 employees in other countries out of their jobs, Apple might be able to hire some here, but they’d also lose a lot of their sales when the price of the new iPhone doubled, and have to lay those workers right back off. And thousands of people in China would be kicked off the lifeline that’s finally pulling that country out of a peasant economy. So if you think Apple’s overseas factory is the reason for 14% real unemployment here in America, you’ll be disappointed to see the hundreds of thousands of American workers harmed by making it harder for Apple to do business. And since the most common fixative I hear liberals support in order to deal with this supposed problem is to levy extra taxes on companies that do business overseas, you’ll be disappointed when all that does is make your vacations and Amazon purchases more expensive. Most of all, if you think damaging UPS and Starwood Hotels’ business is worth it just to “get” companies like Apple, keep in mind the hundreds of thousands of US workers you’re “getting” at the same time, and driving up the cost of goods for every single one of us. All the supposed solutions simply make imports more expensive. If you make imports more expensive, then the end product will be more expensive too, and that’s bad for the customer and manufacturer alike. That just means less business gets done, and you and I have access to less stuff. Protectionary tariffs are one of the things that led to the Great Depression. If you threaten businesses here, some may submit, but none will choose to do business in America any longer if they can help it. Conservatives have an alternative. Free trade makes the world a better place. It’s hard to get many economists to agree on anything, but they generally agree on that. More jobs here, more jobs abroad. If one company moves a call center to India, another company opens its doors here in America. Cheaper goods everywhere. And the more markets we open for American goods to be sold abroad, the more American manufacturing jobs can be created. If you really want to help the poor, that sounds like a good start.